PHOENIX — Pima County will have a new ally in the battle against mosquito-borne diseases this summer: endangered Gila topminnow. The Arizona Game and Fish Department (AZGFD) provided 500 of the native fish, which will be introduced into standing waters in urban county areas. The project is being done under the Department’s federal permits and an Endangered Species Act Habitat Conservation Plan between Pima County and the U.S. Fish and Wildlife Service. The three agencies are cooperatively spearheading this effort to reduce threats to public health in the county. The project is part of an overall plan by Pima County Health Department, Pima County Sustainability and Conservation, the Phoenix Zoo and Arizona State University to use the federally endangered fish to target mosquito larvae and reduce the threat of mosquito-borne diseases, such as the West Nile and Zika viruses. This approach is also being considered for future deployment in Pinal County and hopefully other county governments around the state. In cooperation with AZGFD and the U.S. Fish and Wildlife Service, Pima County will establish a holding facility where Gila topminnows can be stocked and raised. The fish will then be placed into abandoned urban sources of water, such as swimming pools, fountains and backyard ponds within the counties. “This partnership provides Pima County with a smart, conservation minded tool to help us prevent mosquitoes and the diseases they spread,” said Dr. Francisco Garcia, Deputy County Administrator and Chief Medical Officer for Pima County. 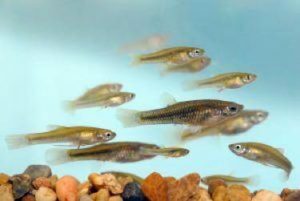 Research over the past 20 years shows that Gila topminnow are just as effective at targeting mosquito larvae as the use of the exotic mosquitofish, which is a non-native species. While mosquitofish have been used with some success in reducing disease-carrying mosquitoes, their use has unintended consequences for native fish and their ecosystems when they escape confinement. The Gila topminnow is a small, short-lived fish, with a general lifespan of less than a year. As their name suggests, topminnows spend the majority of their time close to the water’s surface feeding on plants, small crustaceans and small invertebrates, including mosquito larvae. Historically, topminnow were the most abundant fish species in the Gila River basin from western New Mexico to southern and western Arizona. Over time, habitat loss and degradation brought the topminnow to the brink of extinction. It was listed as a federally endangered species in 1967. Since then, AZGFD and its partners have worked to restore topminnow populations with the goal of delisting the fish.